Fancy a break in Cornwall this Christmas? Stay with us here at Badgers Sett and you will have easy access to the fun filled events taking place all over the County. We have compiled a taster of these fantastic activities to start you off and get you into the Festive Spirit ! Pay a visit to the Lost Gardens of Heligan during the holidays and be immersed in all things festive. Kicking off with their Annual Christmas Fair, where local craft people and artisans showcase their jewellary, paintings, ceramics, food plus many other goodies, perfect for that special present! Heligan is easily accessed from Badgers Sett, just along the A30. Join in the fun this Year at the Annual Padstow Christmas Festival, starting with the Lantern Parade and light up the town with the locals! Padstow is just a 30 minute car journey from Badgers Sett. The Padstow area is home to some of the best Chefs in the Country, Nathen Outlaw, Rick Stein and Paul Ainsworth will be demonstrating in the Festival's Chef Theatre to name but a few! Pop along to the food fair and be tempted by delicious cheeses, artisan breads, specialist wines, figgy puds and many more yummy locally produced treats, a one stop shop for last minute presents if you can stop yourself from indulging in them beforehand! The Christmas lights at Padstow are well worth a visit, strung around this lovely old cornish town, reflecting merrily over the harbour, fun for all the family, this is definitely on our family's list of of places to visit during the holiday! Start to feel truly festive by attending this choral celebration taking place in Truro Cathedral and performed by the Cathedral Choir, where traditional carols will be sung, alongside the ever popular modern day stars. Oh yes you can .... Nothing beats a trip to a rib tickling panto at Christmas. This Year The Miracle Theatre have again come up trumps with their hilarious take on the traditional fairy tale Aladdin. Book seats to take the family along for a show stopping, festive couple of hours and immerse yourself in riotous innuendos, singalongs and magical mayhem! Definitely one for all the family to enjoy. Your out of this world journey commences on Eden's viewing platform, as you wind your way towards the biomes, whilst following a myriad of colourful sculptures, watching the stunning multi coloured lasers shimmering across the outdoor gardens and hearing the distant sound of carols in the background, you will be transported to a world of futuristic fantasy ! Enter each biome and be immersed in stunning displays of colour and light projections, along with live music and spontaneous performances, kids will be spellbound, whilst adults gaze in awe at this spectacular ! For a perfect end to the evening, head on down to the Snow Igloo to capture the moment with a fabulous photo of you all ! As well as many festive events, there are also fun indoor activities such as pottery painting at Starglazers Pottery Painting Cafe in Falmouth. 10% off Listed Price on our Website for Christmas and New Year Stays! 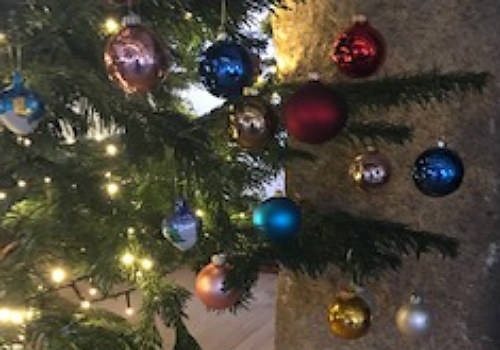 Nestled in a pretty valley and surrounded by beautiful moorland countryside, yet just five miles from the A38 and six miles from the A30, Badgers' Sett Holiday Cottages is conveniently positioned in a central location within Cornwall, enabling easy access to the best events that the County has to offer throughout The Festive Season. Click on one of the cottage links below to check availability and deduct 10% from the listed price for the period 22nd December 2018 to 4th January 2019 (incl). Prices for a 7 night stay now range from just £478.98 for Rosemary Cottage (one bed) to £564.30 for Lavender and Thyme (two bed) Cottages. Short breaks (a minimum of 3 nights) can also be booked if preferred. A great excuse to treat yourself and family to a few days away from it all during the Christmas holidays here with us at Badgers' Sett Holiday Cottages.